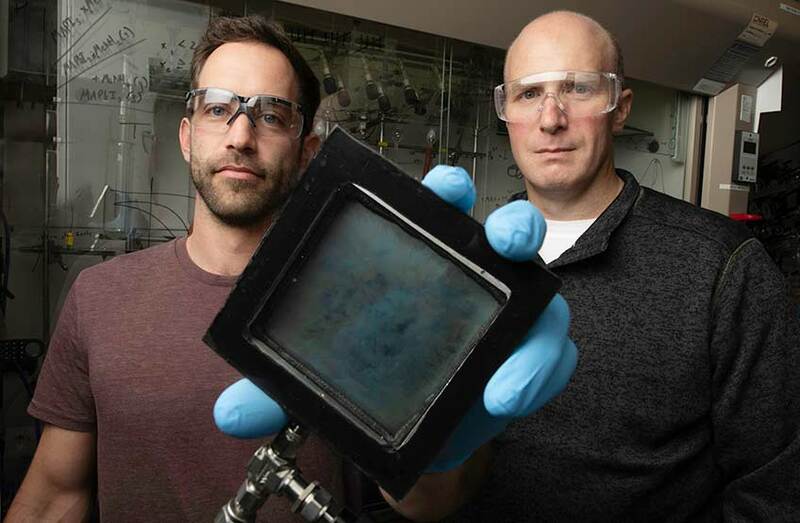 NREL Researcher Lance Wheeler (left) holds a sample of the SwitchGlaze technology alongside Robert Tenent, the laboratory's program lead for window technology. A year after Lance Wheeler attracted international attention for his research detailing a window that could both darken and generate electricity, he's starting over—almost from scratch. As lead author of a paper published in Nature Communications—titled "Switchable Photovoltaic Windows Enabled by Reversible Photothermal Complex Dissociation from Methylammonium Lead Iodide"—Wheeler found himself answering questions from reporters from Canada to Norway and many points in between. Everyone wanted to know: When will this product reach the market? But what works in a laboratory isn't immediately ready for sale. Understanding that, DOE's Building Technologies Office is providing three years of funding for Wheeler and his newly constituted team to perfect the technology behind the window. "The laboratory is transforming energy through research and development on innovative technologies like this one," said Johney Green, NREL's associate laboratory director for Mechanical and Thermal Engineering Sciences. "Our world-class researchers and facilities enable us to catalyze cutting-edge innovations that have the potential to reduce energy use and costs while reducing industry risk for new technology investment." Wheeler, who joined NREL as a postdoctoral research scientist in the summer of 2014, was following up on an accidental discovery. "I was working on making a different material that was inspired by the material we're working on now," he said. "I found that if you took it off of the hot plate it would turn clear." The technology relies on materials called perovskites, which are highly efficient at converting sunlight to electricity. The initial version also used single-walled carbon nanotubes to capture the light, along with layers of titanium dioxide and tin oxide. When light hits this transparent glass, it prompts the release of molecules of methylamine. In turn, the glass darkens and as that happens, electricity is generated. When the sun isn't shining, the molecules are reabsorbed, and the glass becomes clear again. Part of the continuing research will center on better ways to make the switch. In 2016, the Building Technologies Office provided funding for Wheeler and Rob Tenent (NREL's program lead for window technology and co-author of the Nature Communications paper), to participate in a two-month Energy I-Corps program. In this "entrepreneurial boot camp," selected teams of researchers work with industry mentors to develop viable ways to bring their technology to the marketplace. For simplicity's sake, Wheeler and Tenent dubbed their technology SwitchGlaze. "It rolls off the tongue better than switchable photovoltaic window," Wheeler said. Since graduating from the Energy I-Corps program, Tenent continues to work on the SwitchGlaze project as an adviser—and four more scientists have joined the team. David Moore (whose research centers on perovskites and who was another of the seven co-authors on the initial paper), will lend his expertise; as will Emily Warren, who specializes in high-efficiency solar cell; and Rob Guglielmetti, whose role involves modeling the use of energy in buildings. Also playing a part is Colin Wolden, a professor from Colorado School of Mines. "I have dedicated people now," Wheeler said. "It's not going to be as much moonlighting on nights and weekends." From Wheeler's initial discovery to integrating it into a photovoltaic (PV) device took about 18 months. Now, with three years of funding, the focus is on making sure that the device is the best it can be. And while the typical path from the laboratory involves taking a small sample and seeing if it works on a larger scale, this time the idea is to again think small. "That's really what we're working on—making it work better small before we make it bigger," Wheeler said. "There are still more fundamental scientific questions that have to be answered," said Tenent. The biggest potential use of SwitchGlaze windows is as obvious as a city skyline. Commercial buildings, particularly high-rises, are covered with windows, which tend to be the least energy-efficient part of the structures. "One of the challenges they've got is they don't have abundant roof space to put PV on," Tenent said. Incorporating PV into the windows is one answer. "The big goal is definitely to get it into your downtown skyline where you have lots of glass and no roof space," echoed Wheeler. Opportunities for SwitchGlaze also exist in homes, even those that already have rooftop PV. "If you buy a nice skylight, usually it's going to be electronically controlled to have a rain sensor and actuate if it's open or closed," Wheeler said. "The big problem is you have to tear a wall apart to wire it. If you can put the power on board, that's what this switchable energy generation gives you." While the benefits of SwitchGlaze's ability to generate electricity are clear, the durability of the switchable component is key to ensuring the adoption of the technology. The device must be able to switch back and forth between transparent and tinted many more times than has been demonstrated in the lab so far. "Eventually, it's got to switch 50,000 times," Wheeler said. "We've shown it can switch around 20–30 times in the lab right now." "The durability piece of the equation—we actually do a lot of that," said Tenent, an electrochemist. "That's what our core windows program at NREL is based on. We developed the standard for evaluating the durability of electrochromics. The 50,000-cycle threshold is based on the electrochromic standard. It's become kind of a de facto accepted metric." The 2017 proof-of-concept paper established a solar power conversion efficiency of 11.3%. The researchers intend to maintain that figure even over the course of the thousands of switching cycles. Measuring the efficiency of a solar cell also is commonplace at NREL—but moving forward with the SwitchGlaze project will require new equipment tailored to window-integrated PV. "Right now there are things specific to a window and not to a solar panel, like how much light is let through and what sort of solar heat gain you get when you let it through," Wheeler said. "As visible light goes through, what color does it come out on the other side? All those things you can't measure simultaneously with the infrastructure we have now. So, we're building a system that can do all those things: measure its electrical output as well as its window characteristics." With the funds in hand to make SwitchGlaze as ideal a technology as possible, Wheeler can see what lies ahead. "Ideally, what we can do in three years is get it to the point where industry is comfortable taking it on themselves," he said. "That's where we want to be."